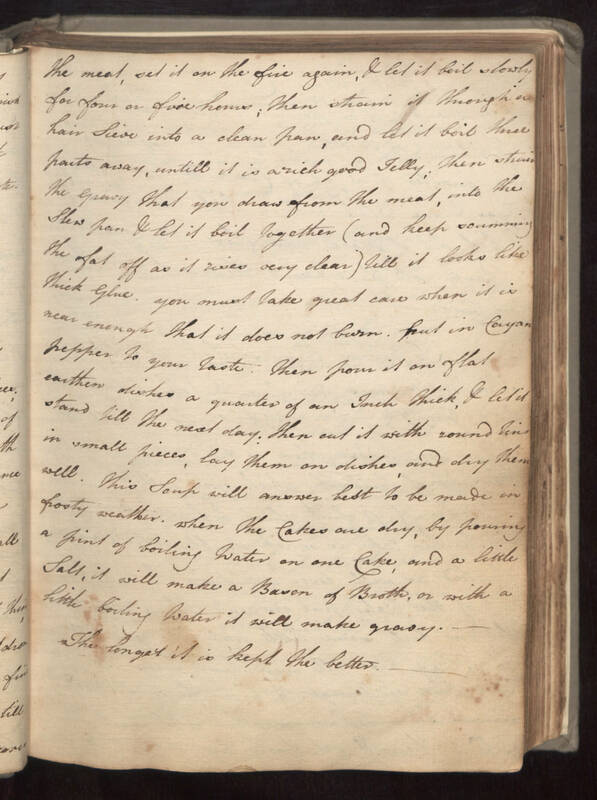 the meat, set it on the fire again, & let it boil slowly for four or five hours; Then strain it through a hair Sieve into a clean pan, and let it boil three parts away, untill it is a rich good Jelly; then strain the gravy that you draw from the meat, into the Stew pan & let it boil together (and keep scumming the fat off as it rises very clear) till it looks like Thick Glue. you must take great care when it is near enough that it does not burn, put in Cayan pepper to you taste. Then pour it on flat earthen dishes a quarter of an Inch Thick, & let it stand till the next day: Then cut it with round tins in small pieces, lay Them on dishes and dry them well. This Soup will answer best to be made in frosty weather. when the Cakes are dry, by pouring a pint of boiling Water on one Cake, and a little Salt, it will make a Bason of Broth, or with a little boiling Water it will make gravy. The longer it is kept the better.